This patent-pending, single-serve, just-add-water package has a rigid fitment inside that acts both as a gripping structure and a mixing mechanism. The pouch is pre-filled with one serving of powder, so the consumer only needs to fill it with water, shake and drink. 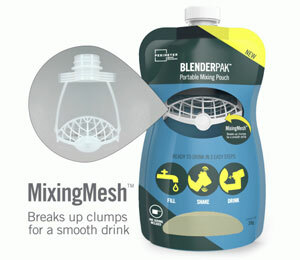 The MixingMesh technology inside the pouch breaks up any clumps of powder to yield a smooth shake at the time of use. BlenderPak is applicable for powdered products that need to be mixed with water, such as protein, meal replacement, nutraceuticals, sugared beverages and others. BlenderPak, says developer, US company Perimeter Brand Packaging, is designed to increase new usage occasions and draw in more users to the powder category. For more information, visit perimeterbp.com/blenderpak.